Mother’s Day (or more correctly Mothering Sunday) in the UK was traditionally a day when daughters working as domestic servants were given time off to return home to worship at their ‘mother church’ – and so the day became synonymous with the idea of family reunions. On their way home along springtime country lanes, the young women would pick wildflowers or violets to present to their mothers as a gift. And so the tradition of giving your mother flowers on Mother’s Day has a long history. Of course, these daughters were usually still unmarried and without children of their own. But today families are more complicated, with distance, the demands of young children, irregular working hours and the competing claims of more than one mother, mother-in-law or stepmother making a simple family reunion more of a challenge. So perhaps there are lessons to learn from the American model of Mother’s Day as a celebration of older women who have made a contribution to our lives, whether as individuals or to society? The commercialization of Mother’s Day is often blamed on influence from the States – but the origins of the festival in the US are still worth revisiting. Mother’s Day in the US was founded in 1908 by Anna Jarvis following the death of her mother, with the aim of celebrating hers and other mothers’ contributions to society. Anna’s mother had been a peace activist, nurse and founder of a movement called Mother’s Day Work Clubs, which aimed to improve public health. Anna objected forcefully to the crass commercialization of Mother’s Day that grew over the following decades, believing that fitting tributes were flowers or homemade, handwritten letters or cards. It’s hard not to agree – and you can find tips for writing a meaningful card over on our blog here. Of course, on Mother’s Day it’s your own mother who will come first to mind – as Anna Jarvis, who trademarked the singular Mother’s Day rather than the general Mothers’ Day, would have agreed. But that’s no reason not to think more widely about the women who have acted as ‘mothers’ or mentors to you – a teacher, an older colleague, a friend who has listened and given you good advice, a neighbour who has helped you out in times of trouble… Mother’s Day can provide a catalyst for delivering a handwritten note or bunch of flowers to show your appreciation of their efforts. Of course, we are biased, but we do believe that nothing spreads more joy than flowers. There is even research from Rutgers State University in New Jersey to prove it! Flowers have also been proved to give joy to the giver – and as every mother knows, the best present is simply to know that your child is happy. So giving flowers, obviously, is a win:win situation. Live it: instead of treating your mother or mother figure a day at a spa, a beauty treatment or a ticket to an exhibition or show, why not choose an activity you can do together or accompany her to something you know she wants to try but has never dared? Remember it: why not create a bespoke photo album of treasured memories of your family or of the next generation? Several online companies will print a book from uploaded digital photos or print your photos on coasters, mugs, etc. Or why not make a music compilation of songs you have shared over the years? Consume it: you could make her a cake or cook her a meal. Or to be on the safe side, you can find details of our fantastic offers from Raimes Sparkling Wine here and Rococo and Urban Village chocolates here. Grow it: a flower delivery is always a treat. But did you know we now offer rose bushes ready to plant out? 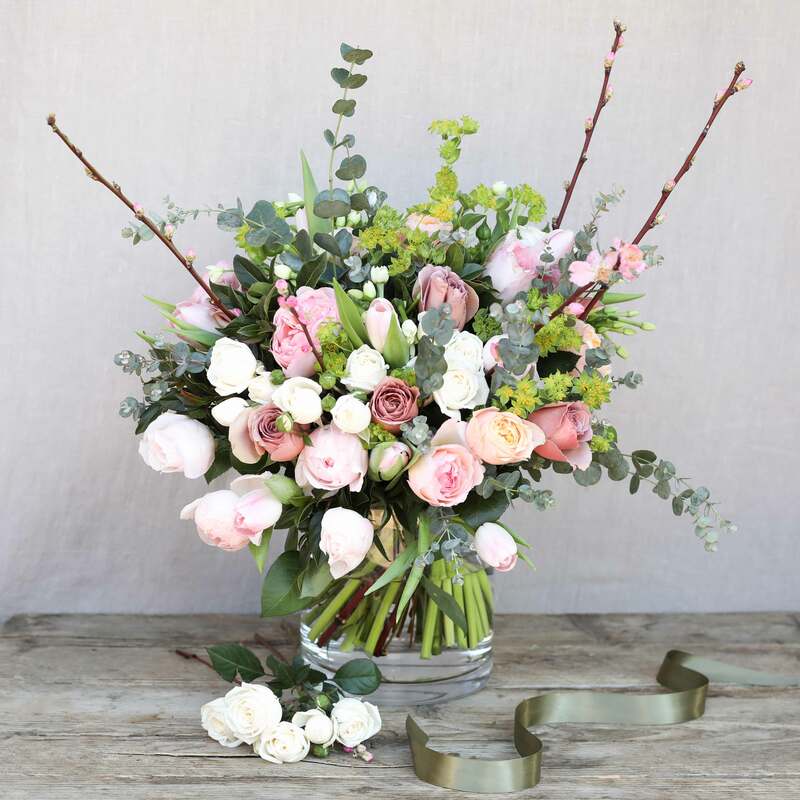 It’s hard to think of a better way than a flush of gloriously scented garden roses in her garden or in a patio container year after year to remind her that you care! 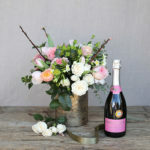 You can browse our Mother’s Day bouquets here or look at some of our wonderful gift offerings here. We offer same day delivery Tuesday to Saturday for orders placed before 4pm.